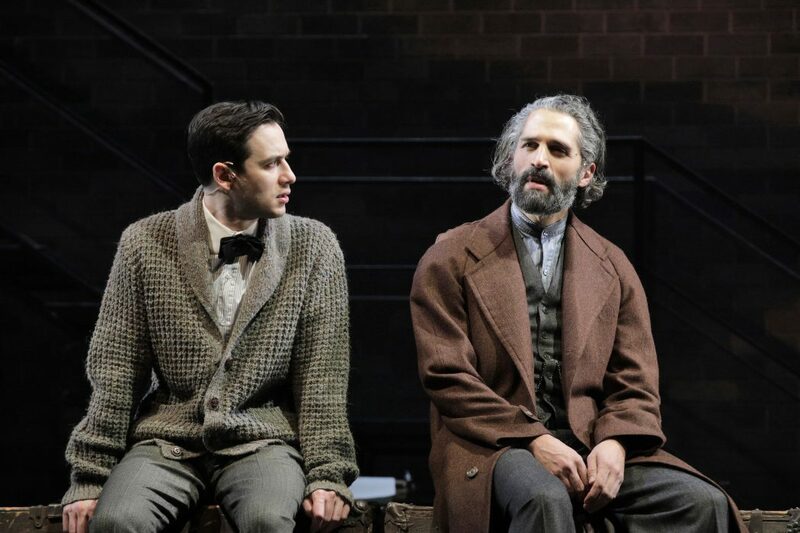 Part musical and part history lesson, Paula Vogel’s “Indecent” illuminates what, for many theatergoers, is an obscure but fascinating event: In 1923 the Broadway cast and producer of a Yiddish drama were arrested for obscenity. The occasion was a performance of Sholem Asch’s “The God of Vengeance,” an English translation of a play that dared depict certain aspects of Jewish life many people would have preferred to be invisible. He boldly depicted Jewish prostitutes, desecration of the Torah in a bordello and a lesbian love affair. Ironically, the producers of the Broadway version had watered down Asch’s original, which he meant to conclude with young women in love dancing provocatively in the rain. Even so, it was too much for New York censors of the day. The gleaming Kansas City Repertory Theatre production of Vogel’s take on this remarkable historical episode earns high marks across the board: Terrific cast, superior design work and efficient pacing by director Eric Rosen (the show runs about 1 hour and 45 minutes without an intermission). The proper description of this production would be “metatheatrical,” meaning a play that doesn’t bother hiding the artificial nature of theatrical art. Thus, on one level the show is a play within a play as Vogel periodically inserts scenes from “The God of Vengeance” into a broader story of Asch’s immigration to New York and the growing violent antisemitism in Europe. So we aren’t only watching actors playing real people. Rather, we see actors playing actors playing historical characters. In a nod to Thornton Wilder’s “Our Town,” we are greeted at the outset by the Stage Manager (the excellent Ben Cherry), who pats dust off his sleeves (as though he had been in storage) and introduces members of the company to the audience. Each actor plays more than one role, and Cherry embodies Lemml, a novice theatrical artist who becomes the greatest lifelong advocate for Asch’s play. Cherry also has the benefit of inhabiting the best-written role. He becomes the human connection for the viewers. Asch, played by Max Wolkowitz, is a less compelling character as written. Victor Raider-Wexler claims his share of good moments in multiple roles, including legendary actor Joseph Schildkraut. So does Susan Rome, who brings humor and specificity to a range of “elder” roles. Emily Shackelford impresses in multiple “ingenue” roles, at one point shifting gears between an actress initially cast in in “God of Vengeances” as well as the performer who later replaces her. Equally impressive is her counterpart, the willowy Susan Lynskey. And several members of the company play multiple roles as well as musical instruments: John Milosich, Maryn Shaw and Alexander Sovronsky (who wrote some original music for the show and served as it music director). Scenic designer Jack Magaw creates an intoxicating and flexible series of environments for the players, Linda Roethke’s costumes are impressive, visually appealing but practical enough for quick costume changes. The stalwart Jeff Cady designed the projections, Andre Pluess crafted the sound design and Erika Chong Shuch contributed choreography. I admire Vogel’s unconventional take on a salient moment in theater history but the play’s structure inhibits any sense of forward momentum. We’re never in one place or a single moment long enough for specific events to sink in. Projected supertitles help us maintain a sense of where and when. Otherwise, we’d be lost. The show works on a cerebral level but it rarely invites a visceral response. That said, this material plays into Rosen’s wheelhouse. He can direct conventional plays with the best of them but he’s consistently drawn to the unconventional. He likes material that tells a story in an unusual way. As we’ve come to expect from the former Rep artistic director, this production is a feast for the senses. And he (and the playwright) saves the best for last: The censored scene from Asch’s drama, the two lovers dancing in the rain. Rosen employs real water and Lynskey and Shackelford evoke all the spontaneity and joy one expects from young people in love. It’s a strong image to send viewers home with. 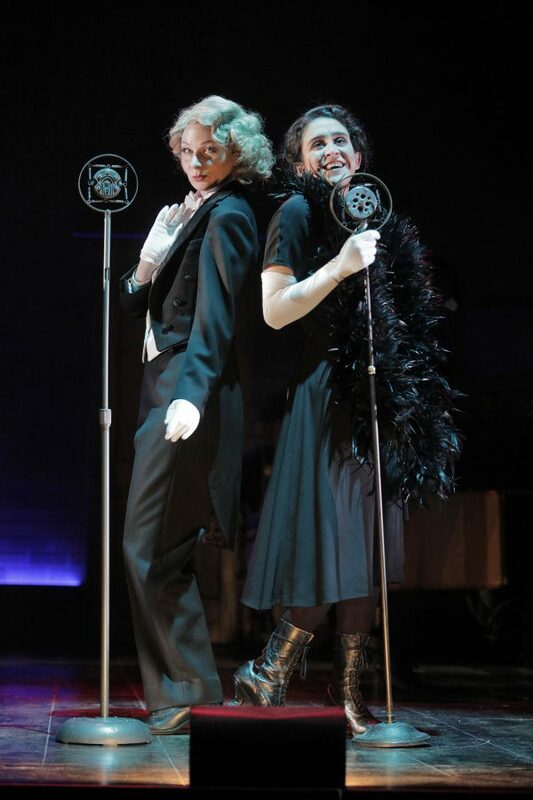 “Indecent” runs through Feb. 10 at the Spencer Theatre. Call 816-235-2700 or visit www.kcrep.org.